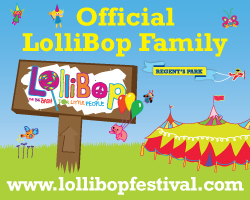 We're so excited that we've been invited as a family to go to Lollibop Festival this year. For those who don't know it's a festival aimed at children under 10, taking place in Regent's Park on the 5th - 7th August. It's a fun day out with a festival vibe without the hassle of camping or driving for miles in the car. All the entertainment is aimed at children and there is something for all! That's not to say that adults aren't catered for: there will be guest musicians and DJ's, relaxing cocktails, tea and treatments, market stalls and a real ale festival bar! Highlights of the festival will include: The Zingzillas, Minimission (an Ibiza style baby disco! ), Charlie and Lola, dance workshops, balloon shows, demonstrations from the Science Museum, Fairy and Wizard School amongst many other things. I'm really looking forward to taking Isla to this as I think she will thoroughly enjoy it and in the run up to the weekend I will be hosting a competition for my readers to win a Family ticket for 4 to go to Lollibop on whichever day you choose over the weekend. If you're unlucky in the competition I'll also have a discount code whereby you can buy reduced price tickets. Keep an eye out for further updates on I Heart Motherhood for Lollibop and check out the Lollibop site for more information! Wicked - would love to go! Looking forward to the comp! !